What do you do when you're sick of eating candy? Turn it into a new kind of candy and eat more of it. We're just stepping (lumbering?) out of our post-Halloween sugar haze, and the treat bag pickings are slim. Aeros, Smarties, and those little wrapped rice candies abound. The boyfriend circles our son's candy bag like a chocolate vulture, but we're all kind of over what's left. Desperate times. This recipe is kind of like chocolate upcycling. First we have the fudgiest brownies, baked in muffin tins and drizzled with a thin black cocoa glaze (you can use regular cocoa--no big deal). 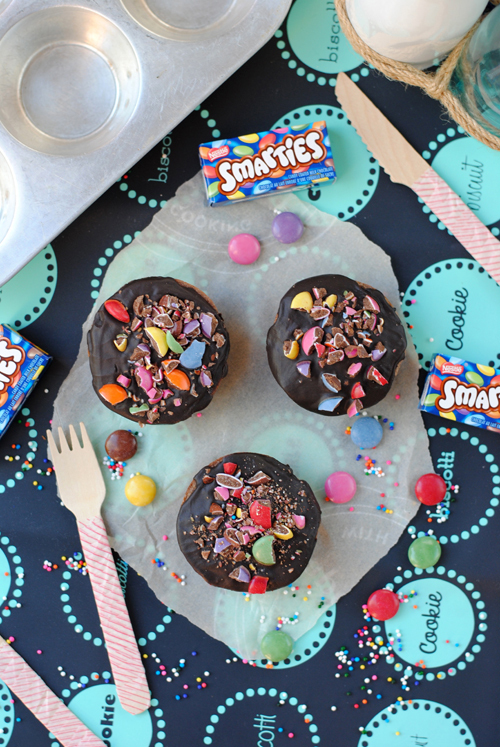 Top them with Smarties (kind of like M&Ms to you non-Canadians) but any leftover chocolate will do. Just bake, glaze, and sprinkle your way to a dressed-up treat. Heat butter and 3/4 of the chocolate chips in a saucepan over low heat, stirring often to avoid burning. Once the chips are melted, cool the mix to room temperature. Combine the eggs and sugar in a mixing bowl, and stir until they’re light and fluffy. Add the vanilla and salt and combine. Gradually add the flour to the egg mixture, until blended. Then stir in the cooled chocolate and mix thoroughly. Throw the rest of the chocolate chips into the mix and give it a stir. Pour batter into a greased muffin tin, about halfway in each cup, and bake for 10-15 minutes. Underbake them slightly for delicious centres. Remove from the tins and place on a wire rack to cool. Meanwhile, make the glaze by combining icing sugar, cocoa, and 1 tablespoon of liquid in a medium bowl. Whisk, adding more liquid as needed. Once well blended but still slightly thick, spoon onto the cooled brownies. Sprinkle with candy and let set! Store at room temperature, in a sealed container, for up to 3 days.